The Oral History Reader, now in its third edition, is a comprehensive anthology combining major, ‘classic’ articles with cutting-edge pieces on the theory, method and use of oral history. When I was a little boy I lived in a little town which you probably never heard of called Henning, Tennessee, about fifty miles north of Memphis. And I lived there with my parents in the home of my mother’s mother. And my grandmother and I were very, very close. Every summer that I can remember, growing up in Henning, my grandmother would have, as visitors, members of the family, who were always women, always of her general age range, the late forties, early fifties. They came from places that sounded pretty exotic to me—Dyersburg, Tennessee, Inkster, Michigan—places like that, St. Louis, Kansas City. They were like Cousin Georgia, Aunt Plus, Aunt Liz, so forth. And every evening, after the supper dishes were washed, they would go out on the front porch and sit in cane-bottomed rocking chairs, and I would always sit behind grandma’s chair. And every single evening of those summers, unless there was some particularly hot gossip that would overrule it, they would talk about the same thing. It was bits and pieces and patches of what I later would learn was a long narrative history of the family which had been passed down across generations. As a little boy I did’t have the orientation to understand most of what they talked about. Sometimes they would talk about individuals, and I did’t know what these individuals were often; I did’t know what an old massa was, I didn’t know what an old missus was. They would talk about locales; I didn’t know what a plantation was. And then at other times, interspersed with these, they’d talk about anecdotes, incidents which had happened to these people or these places. The furthest-back person that they ever talked about was someone whom they would call ‘The African’. And I know that the first time I ever heard the word Africa or African was from their mouths, there on the front porch in Henning. I think that my first impression that these things they spoke of went a long way back, came from the fact that they were wrinkled, greying, or completely grey in some cases, and I was a little boy, three, four, five, and now and then when some of them would get animatedly talking about something, they would fling their finger or hand down towards me and say something like ‘I wasn’t any bigger than this young’ un here’. And the very idea that someone as old and wrinkled as she had at one time been no older than I was just blew my mind. I knew it must be way, way back that they were talking about. When they were speaking of this African, the furthest-back person of all, they would tell how he was brought on a ship to this country to a place they pronounced as ‘Naplis’. And he was bought off this ship by a man whose name was John Waller, who had a plantation in a place called Spotsylvania County, Virginia. And then they would tell how he was on this plantation and he kept trying to escape. The first three times he escaped he was caught and given a worse beating than previously as his punishment. And then the fourth time he escaped he had the misfortune to be caught by a professional slave catcher. And I grew up hearing how this slave catcher decided to make an example of him. And I grew up hearing how he gave the African the choice either to be castrated or to have a foot cut off. And the African chose the foot. And I grew up hearing how his foot was put against a stump, and with an ax was cut off across the arch. It was a very hideous act. But as it turned out that act was to play a very major role in the keeping of a narrative across a family for a long time. The reasons were two. One of them was that in the middle 1700s in Virginia, almost all slaves were sold at auction. A male slave in good condition would bring on the average about $750. At the end of every slave auction they would have what they called the scrap sale, and those who were incapacitated, ill, or otherwise not so valuable for market, would be sold generally for amounts of $100 or less in cash. And this particular African managed to survive and then to convalesce, and he posed then to his master an economic question. And his master decided that he was crippled and he hobbled about, but he could still do limited work. And the master decided that he would be worth more kept on that plantation than he would be worth sold away for cash of less than $100. And that was how it happened that this particular African was kept on one plantation for quite a long period of time. Now that came at a time when, if there was any single thing that probably characterized slaves, it was that they had almost no sense of what we today know and value and revere as family continuity. And the reason simply was that slaves were sold back and forth so much. Characteristically slave children would grow up without an awareness of who their parents were, and particularly male parents. This African, now kept on the plantation by his master’s decision, hobbling about and doing the limited work he could, finally met and mated with another slave on that plantation, and her name (in the stories told by my grandmother and the others on the front porch in Henning) was Bell the big house cook. And of that union was born a little girl who was given the name Kizzy. As Kizzy got to be four or five or so, this African would take that little girl by the hand, and he would take her around and point out to her various natural objects, and he would tell her the name for that thing—tree, rock, cow, sky, so forth. The names that he told her were instinctively in his native tongue, and to the girl they were strange phonetic sounds which in time, with repetitive hearing, the girl could repeat. He would point at a guitar and he would make a single sound as if it were spelled ko. And she came in time to know that ko was guitar in his terms. There were other strange phonetic sounds for other objects. Perhaps the most involved of them was that contiguous to the plantation there was a river, and whenever this African would point out this river to his daughter Kizzy he would say to her ‘Kamby Bolongo’. And he came to know that Kamby Bolongo in his terms meant river. There was another thing about this African which is in the background of all the Black people in this country, and that was that whoever bought them off the slave ship, when they got them to a plantation, about their first act was giving them an Anglicized name. For all practical purposes that was the first step in the psychic dehumanization of an individual or collectively of a people. And in the case of this particular African his master gave him the name Toby. But whenever any of the other adult slaves would address him as Toby, this African would strenuously rebuff and reject it and he would tell them his name was ‘Kin-tay’, a sharp, angular two-syllabic sound that the little girl Kizzy came to know her father said was his name. And there was yet another thing about this African characteristic of all those original Africans in our background, and that was that they had been brought from a place where they spoke whatever was their native tongue, and brought to this place where it became necessary to learn English for sheer survival’s sake. And gradually, haltingly, all those original Africans learned a word here, a phrase there, of the new tongue—English. As this process began to happen with this African, and he began to be able to express himself in more detailed ways, he began to tell his little daughter Kizzy little vignettes about himself. He told her, for instance, how he had been captured. He said that he had not been far away from his village chopping wood to make himself a drum when he had been set upon by four men, overwhelmed, and taken thusly into slavery. And she came to know along with many other stories the story of how he was chopping wood when he was captured. To compress what would happen over the next decade, the girl Kizzy stayed on the plantation in Spotsylvania County directly exposed to her father who had come directly from Africa, and to his stories, until she had a considerable repertoire of knowledge about him from his own mouth. When Kizzy was sixteen years of age, she was sold away to a new master whose name was Tom Lea and he had a much smaller plantation in North Carolina. And it was on this plantation that after a while Kizzy gave birth to her first child, a boy who was given the name George. The father was the new master Tom Lea. And as George got to be four or five or so, it was his mother Kizzy who began to tell him the stories that she heard from her father. And the boy began to discover the rather common phenomenon that slave children rarely knew who their fathers were, let alone a grandfather. He had something which made him rather singular. And so it was with considerable pride the boy began to tell his peers the story of his grandfather; this African who said his name was Kin-tay, who called a river Kamby Bolongo, and called a guitar ko and other sounds for other things, and who said that he had been chopping wood when he was set upon and captured and brought into slavery. When the boy George got to be about twelve, he was apprenticed to an old slave to learn the handling of the master’s fighting gamecocks. And this boy had an innate, green thumb ability for fighting gamecocks. By the time he was in his mid-teens he had been given (for his local and regional renown as an expert slave handler and pitter of fighting gamecocks) the nickname he would take to his grave decades later—Chicken George. When Chicken George was about eighteen he met and mated with a slave girl. And her name was Matilda, and in time Matilda gave birth to seven children. Now for the first time that story which had come down from this African began to fan out within the breadth of a family. The stories as they would be told on the front porch in Henning by grandma and the others were those of the winter evenings after the harvest when families would entertain themselves by sitting together and the Elders would talk and the young would listen. Now Chicken George would sit with his seven children around the hearth. The story was that they would roast sweet potatoes in the hot ashes, and night after night after night across the winters, Chicken George would tell his seven children a story unusual among slaves, and that was direct knowledge of a great-grandfather; this same African who said his name was Kin-tay, who called the river Kamby Bolongo, and a guitar ko, and who said that he was chopping wood when he was captured. Those children grew up, took mates and had children. One of them was named Tom. And Tom became an apprenticed blacksmith. He was sold in his mid-teens to a man named Murray who had a tobacco plantation in Alamance County, North Carolina. And it was on this plantation that Tom, who became that plantation’s blacksmith, met and mated with a slave girl whose name was Irene and who was the plantation weaver. And Irene also in time bore seven children. Now it was yet another generation, another section of the state of North Carolina and another set of seven children who would sit in yet another cabin, around the hearth in the winter evenings with the sweet potatoes in the hot ashes. And now the father was Tom telling his children about something virtually unique in the knowledge of slaves, direct knowledge of a great-great-grandfather, this same African, who said his name was Kin-tay, who called the river Kamby Bolongo, who said he was chopping wood when he was captured, and the other parts of the story that had come down in that way. Of that second set of seven children, in Alamance County, North Carolina, the youngest was a little girl whose name was Cynthia, and Cynthia was my maternal grandmother. And I grew up in her home in Henning, Tennessee, and grandma pumped that story into me as if it were plasma. It was by all odds the most precious thing in her life—the story which had come down across the generations about the family going back to that original African. One morning, I was in the British Museum and I came upon something, I had vaguely heard of it, the Rosetta Stone. It just really entranced me. I read about it, and I found how, when this stone was discovered in 1799, it seemed to have three sets of texts chiseled into the stone: one of them in Greek characters, which Greek scholars could read, the second in a then-unknown set of characters, the third in the ancient hieroglyphics which it was assumed no one would ever translate. Then I read how a French scholar, Jean Champollion, had come along and had taken that second unknown set of script, character for character, matched it with the Greek and finally had come up with a thesis he could prove—that the text was the same as the Greek. And then in a superhuman feat of scholarship he had taken the terribly intricate characters of the hieroglyphics and cross matched them with the preceding two in almost geometric progression, and had proved that too was the same text. That was what opened up to the whole world of scholarship, all that hitherto had been hidden behind the mystery of the allegedly undecipherable hieroglyphics. And that thing just fascinated me. I would find myself going around London doing all sorts of other things and at odd times I would see in my mind’s eye, almost as if it were projected in my head, the Rosetta Stone. And to me, it just had some kind of special significance, but I couldn’t make head or tail of what it might be. Finally I was on a plane coming back to this country, when an idea hit me. It was rough, raw, crude, but it got me to thinking. Now what this scholar worked with was language chiseled into the stone. And what he did was to take that which had been unknown and match it with that which was known, and thus found out the meaning of what hitherto had been unknown. And then I got to thinking of an analogy: that story always told in our family that I had heard on the front porch in Henning. The unknown quotient was those strange phonetic sounds. And I got to thinking, now maybe I could find out where these sounds came from. Obviously these strange sounds are threads of some African tongue. And my whole thing was to see if maybe I could find out, just in curiosity, what tongue did they represent. It seemed obvious to me what I had to do was try to get in touch with as wide a range of Africans as I could, simply because there were many, many tongues spoken in Africa. I lived in New York, so I began doing what seemed to me logical. I began going up to the United Nations lobby about quitting time. It wasn’t hard to spot Africans, and every time I could I’d stop one. And I would say to him my little sounds. In a couple of weeks I stopped a couple of dozen Africans, each and every one of which took a quick look, quick listen to me, and took off. Which I well understand; me with a Tennessee accent trying to tell them some African sounds, I wasn’t going to get it. I have a friend, a master researcher, George Sims, who knew what I was trying to do and he came to me with a listing of about a dozen people renowned for their knowledge of African linguistics. And one who intrigued me right off the bat was not an African at all, but a Belgian. Educated at England, much of it at the School of Oriental and African Studies, he had done his early work living in African villages, studying the language or the tongue as spoken in those villages. He had finally written a book called in French, La Tradition Orale. His name: Dr. Jan Vansina, University of Wisconsin. I phoned Dr. Vansina and he very graciously said I could see him. I got on a plane and flew to Madison, Wisconsin, with no dream of what was about to happen. In the living room of the Vansinas that evening I told Dr. Vansina every little bit I could remember of what I’d heard as a little boy on the front porch in Henning. And Dr. Vansina listened most intently. And then he began to question me. Being himself an oral historian, he was particularly interested in the physical transmission of the story down across the generations. And I would answer everything I could. I couldn’t answer most of what he asked. Around midnight, Dr. Vansina said, ‘I wonder if you’d spend the night at our home,’ and I did stay there. The following morning, before breakfast, Dr. Vansina came down with a very serious expression on his face; I was later to learn that he had already been on the phone with colleagues, and he said to me: ‘The ramifications of what you have brought here could be enormous.’ He and his colleagues felt almost certain that the collective sounds that I had been able to bring there, which had been passed down across the family in the manner I had described to him, represented the Mandinka tongue. I’d never heard the word. He told me that that was the tongue spoken by the Mandingo people. He then began to guess translate certain of the sounds. There was a sound that probably meant cow or cattle; another probably meant the bow-bow tree, generic in West Africa. I had told him that from the time I was knee-high I’d heard about how this African would point to a guitar and say ko. Now he told me that almost surely this would refer to one of the oldest stringed instruments among the Mandingo people, an instrument made of a gourd covered with goat skin, a long neck, 21 strings, called the kora. He came finally to the most involved of the sounds that I had heard and had brought to him—Kamby Bolongo. He said without question in Mandinka, bolongo meant river; preceded by Kamby it probably would mean Gambia River. I’d never heard of that river. It was Thursday morning when I heard those words; Monday morning I was in Africa. I just had to go. There was no sense in messing around. On Friday I found that of the numerous African students in this country, there were a few from that very, very small country called Gambia. And the one who physically was closest to me was a fellow in Hamilton College, Clinton, New York. And I hit that campus about 3:30 Friday afternoon and practically snatched Ebou Manga out of an economics class and got us on Pan American that night. We flew through the night to Dakar, Senegal, and there we got a light plane that flew over to a little airstrip called Yundum—they literally had to run monkeys off the runway to get in there. And then we got a van and we went into the small city of Bathurst, the capital of Gambia. Ebou Manga, his father Alhaji Manga (it’s a predominantly Moslem culture there), assembled a group of about eight men, members of the government, who came into the patio of the Atlantic Hotel, and they sat in kind of a semi-circle as I told them the history that had come down across the family to my grandmother and thence to me; told them everything I could remember. And when I finished, the Africans irritated me considerably because Kamby Bolongo, the sounds which had gotten me specifically to them, they tended almost to poo-poo. They said, ‘Well, of course Kamby Bolongo would mean Gambia River; anyone would know that.’ What these Africans reacted to was another sound: a mere two syllables that I had brought them without the slightest comprehension that it had any particular significance. They said, ‘There may be some significance in that your forefather stated his name was Kin-tay.’ I said, ‘Well, there was nothing more explicit in the story than the pronunciation of his name, Kin-tay.’ They said, ‘Our oldest villages tend to be named for those families which founded those villages centuries ago.’ And then they sent for a little map and they said, ‘Look, here is the village of Kinte-Kundah. And not too far from it is the village of Kinte-Kundah-Janneh-Ya.’ And then they told me about something I never had any concept existed in this world. They told me that in the back country, and particularly in the older villages of the back country, there were old men called griots, who are in effect walking, living archives of oral history. They are the old men who, from the time they had been in their teen-ages, have been part of a line of men who tell the stories as they have been told since the time of their forefathers, literally down across centuries. The incumbent griot will be a man usually in his late sixties, early seventies, and underneath him will be men separated by about decade intervals, sixty, fifty, forty, thirty, twenty, and a teen-age boy, and each line of griots will be the experts in the story of a major family clan; another line of griots another clan; and so on for dozens of major clans. Another line of griots would be the experts in the history of a group of villages. Another would go into the history of the empires which had preceded it, and so forth. And the stories were told in a narrative, oral history way, not verbatim, but the essential same way they had been told down across the time since the forefathers. And the way they were trained was that the teen-age boy was exposed to that story for forty or fifty years before he would become the oral historian incumbent. It astounds us now to realize that men like these, in not only Africa but other cultures, can literally talk for days, telling a story and not repeat themselves, and telling the details in the most explicit details. The reason it astounds us is because in our culture we have become so conditioned to the crush of print that most people in our culture have almost forgotten what the human memory is capable of if it is trained to keep things in it. These men, I was told, existed in the back country. And the men there told me that since my forefather had said his name was Kin-tay they would see what they could do to help me. I came back to this country enormously bewildered. I didn’t know what to do. It embarrasses me to say that up to that time I really hadn’t thought all that much about Africa. I knew where it was and I had the standard cliché images of it, the Tarzan Africa and stuff like that. Well, now it was almost as if some religious zealotry came into me. I just began to devour everything I could lay eyes on about Africa, particularly slavery. I can remember after reading all day I’d sit on the edge of a bed at night with a map of Africa, studying the positions of the countries, one with relation with the other. It was about six weeks later when an innocuous looking letter came to me which suggested that when it was possible I should come back. I was back over there as quickly as I possibly could make it. The same men, with whom I had previously talked rather matter-of-factly, told me that the word had been put out in the back country and that there had indeed been found a griot of the Kinte clan. His name, they said, was Kebba Kanga Fofana. When I heard there was such a man I was ready to have a fit. Where is he? I figured from my experience as an American magazine writer, the government should have had him there with a public relations man for me to talk to. And they looked at me oddly and they said, he’s in his village. I discovered at that point that if I was to see this man, I was going to have to do something I’d never dreamed before: I would have to organize a safari. It took me three days to rent a launch to get up the river, lorry, Land-Rover to take supplies by the back route, to hire finally a total of fourteen people, including three interpreters, four musicians (they told me in the back country these old oral historians would not talk without music in the background), bearers and so forth. And on the fourth day we went vibrating in this launch up the Gambia River. I was very uncomfortable. I had the feeling of being alien. I had the queasy feeling of what do they see me as, another pith-helmet? We got on up the river to a little village called Albreda on the left bank. And then we went ashore. And now our destination by foot was a village called Juffure where this man was said to live. There’s an expression called ‘the peak experience’. It is that which emotionally nothing in your life ever can transcend. And I know I have had mine that first day in the back country in black West Africa. When we got up within sight of the village of Juffure the children who had inevitably been playing outside African villages, gave the word and the people came locking out of their huts. It’s a rather small village, only about seventy people. And villages in the back country are very much today as they were two hundred years ago, circular mud huts with conical thatched roofs. And from a distance I could see this small man with a pillbox hat and an off-white robe, and even from a distance there was an aura of ‘somebodiness’ about him. I just knew that was the man we had come to see. And when we got closer the interpreters left our party and went straight to him. And I had stepped unwittingly into a sequence of emotional events that always I feel awkward trying to describe, simply because I never ever verbally could convey, the power, the physical power of emotional occurrences. These people quickly filtered closely around me in kind of a horseshoe design with me at the base. If I had put up my hands I would have touched the nearest ones on either side. There were about three, four deep all around. And the first thing that hit me was the intensity of the way they were staring at me. The eyes just raped. The foreheads were forward in the intensity of the staring. And it was an uncomfortable feeling. And while this was happening there began to occur inside me a kind of feeling as if something was turgid, rolling, surging around. And I had this eerie feeling that I knew inside why it was happening and what it was about, but consciously I could not identify what had me so upset inside. And after a while it began to roll in: it was rather like a galeforce wind that you couldn’t see but it just rolled in and hit you—bam! It was enough to knock you down. I suddenly realized what upset me so was that I was looking at a crowd of people and for the first time in my life every one of them was jet black. And I was standing there rather rocked by that, and in the way that we tend to do if we are discomforted, we drop our glance. And I remember dropping my glance, and my glance falling on my own hand, my own complexion, in context with their complexion. And now there came rolling in another surging galeforce that hit me perhaps harder than the first one. A feeling of guilt, a feeling rather of being hybrid, a feeling of being the impure among the pure. And the old man suddenly left the interpreters, walked away, and the people quickly filtered away from me and to the old man. And they began a very animated talking, high metallic Mandinka tongue. One of the interpreters, his name was A.B.C. Salla, whispered in my ear and the significance of what he whispered probably got me as much as all the rest of it collectively. He said, ‘They stare at you so because they have never seen a black American.’ And what hit me was they were not looking at Alex Haley, writer, they didn’t know who he was, they couldn’t care less. But what they saw was a symbol of twenty-five million of us over here whom they had never seen. And it was just an awesome thing to realize that someone had thrust that kind of symbolism upon me. And there’s a language that’s universal. It’s a language of gestures, noises, inflections, expressions. Somehow looking at them, hearing them, though I couldn’t understand a syllable, I knew what they were talking about. I somehow knew they were trying to arrive at a consensus of how did they collectively feel about me as a symbol for them of all the millions of us over here whom they never had seen. And there came a time when the old man quickly turned. He walked right through the people, he walked right past three interpreters, he walked right up to me, looking piercingly into my eyes and spoke in Mandinka, as if instinctively he felt I should be able to understand it. And the translation came from the side. And the way they collectively saw me, the symbol of all the millions of black people here whom they never had seen was, ‘Yes, we have been told by the forefathers that there are many of us from this place who are in exile in that place called America and in other places.’ And that was the way they saw it. The old man, the griot, the oral historian, Kebba Kanga Fofana, seventy-three rains of age (their way of saying seventy-three years, one rainy season a year), began now to tell me the ancestral history of the Kinte clan as it had been told down the centuries, from the times of the forefathers. It was as if a scroll was being read. It wasn’t just talk as we talk. It was a very formal occasion. The people became mouse quiet, rigid. The old man sat in a chair and when he would speak he would come up forward, his body would grow rigid, the cords in his neck stood out and he spoke words as though they were physical objects coming out of his mouth. He’d speak a sentence or so, he would go limp, relax, and the translation would come. Out of this man’s head came spilling lineage details incredible to behold. Two, three centuries back. Who married whom, who had what children, what children married whom and their children, and so forth, just unbelievable. I was struck not only by the profusion of details, but also by the biblical pattern of the way they expressed it. It would be something like: ‘and so and so took as a wife so and so and begat and begat and begat’, and he’d name their mates and their children, and so forth. When they would date things it was not with calendar dates, but they would date things with physical events, such as, ‘in the year of the big water he slew a water buffalo’, the year of the big water referring to a flood. And if you wanted to know the date calendar-wise you had to find when that flood occurred. I can strip out of the hours that I heard of the history of the Kinte clan (my forefather had said his name was Kin-tay), the immediate vertical essence of it, leaving out all the details of the brothers and the cousins and the other marriages and so forth. The griot Kebba Kanga Fofana said that the Kinte clan had been begun in a country called Old Mali. Traditionally the Kinte men were blacksmiths who had conquered fire. The women were potters and weavers. A branch of the clan had moved into the country called Mauretania. It was from the country of Mauretania that a son of the clan, whose name was Kairaba Kunta Kinte (he was a Marabout, which is to say a holy man of the Moslem faith), came down into the country called the Gambia. He went first to a village called Pakali n’Ding. He stayed there for a while. He went next to a village called Jiffarong; thence he went to a village called Juffure. In the village of Juffure the young Marabout Kairaba Kunta Kinte took his first wife, a Mandinka maiden whose name was Sireng. And by her he begat two sons whose names were Janneh and Saloum. Then he took a second wife; her name, Yaisa. And by Yaisa he begat a son whose name was Omoro. Those three sons grew up in the village of Juffure until they came of age. The Elder two, Janneh and Saloum, went away and started a new village called Kinte-Kundah Janneh-Ya. It is there today. Literally translated means ‘The Home of Janneh Kinte’. The youngest son, Omoro, stayed in the village until he had thirty rains, and then he took a wife, a Mandinka maiden, her name Binta Kebba. And by Binta Kebba, roughly between 1750 and 1760, Omoro Kinte begat four sons, whose names were Kunta, Lamin, Suwadu and Madi. By the time he got down to that level of the family, the griot had talked for probably five hours. He had stopped maybe fifty times in the course of that narrative and a translation came into me. And then a translation came as all the others had come, calmly, and it began, ‘About the time the king’s soldiers came.’ That was one of those time-fixing references. Later in England, in British Parliamentary records, I went feverishly searching to find out what he was talking about, because I had to have the calendar date. But now in back country Africa, the griot Kebba Kanga Fofana, the oral historian, was telling the story as it had come down for centuries from the time of the forefathers of the Kinte clan. ‘About the time the king’s soldiers came, the eldest of these four sons, Kunta, went away from this village to chop wood and was seen never again.’ And he went on with his story. I sat there as if I was carved out of rock. Goose-pimples came out on me I guess the size of marbles. He just had no way in the world to know that he had told me that which meshed with what I’d heard on the front porch in Henning, Tennessee, from grandma, from Cousin Georgia, from Aunt Liz, from Cousin Plus, all the other old ladies who sat there on that porch. I managed to get myself together enough to pull out my notebook, which had in it what grandma had always said. And I got the interpreter Salla and showed it to him and he got rather agitated, and he went to the old man, and he got agitated, and the old man went to the people and they got agitated. I don’t remember it actually happening. I don’t remember anyone giving an order, but those seventy people formed a ring around me, moving counter-clockwise, chanting, loudly, softly, loudly, softly, their bodies were close together, the physical action was like drum majorettes with their high knee action. You got the feeling they were an undulating mass of people moving around. I’m standing in the middle like an Adam in the desert. I don’t know how I felt; how could you feel a thing like that? And I remember looking at the first lady who broke from that circle (there were about a dozen ladies who had little infant children slung across their backs), and she with a scowl on this jet black face, broke from that circle, her bare feet slapping against the hard earth, came charging in towards me. And she took her baby and roughly thrust it out. The gesture said, ‘Take it!’ and I took the baby and I clasped it, at which point she snatched it away and another lady, another baby, and I guess I had clasped about a dozen babies in about two minutes. It would be almost two years later at Harvard when Dr. Jerome Bruner told me, you were participating in one of the oldest ceremonies of humankind called ‘the laying on of hands’; that in their way they were saying to you, ‘through this flesh which is us, we are you, and you are us’. There were many, many other things that happened in that village that day, but I was particularly struck with the enormity of the fact that they were dealing with me and seeing me in the perspective of, for them, the symbol of twenty-five million of us black people in this country whom they never had seen. They took me into their mosque. They prayed in Arabic which I couldn’t understand. Later the crux of the prayer was translated, ‘Praise be to Allah for one long lost from us whom Allah has returned.’ And that was the way they saw that. When it was possible to leave, since we’d come by water, I wanted to go out over the land. My five senses had become muted, truncated. They didn’t work right. If I wanted to feel something I would have to squeeze to register the sense of feeling. Things were misty. I didn’t hear well. I would become aware the driver sitting right by me was almost shouting something and I just hadn’t heard him up to that point. I began now, as we drove out over the back country road, with drums distantly heard around, to see in my mind’s eye, as if it were being projected somehow on a film, a screen almost, rough, ragged, out of focus, almost a portrayal of what I had studied so, so much about: the background of us as a people, the way that ancestrally we who are in this country were brought out of Africa. […] ~ Alex Haley. “The essays on the public history aspects of oral history usage are a must read! I hope that professors use this as a text book for an oral history class. I encourage them to allow students to pick from the various articles according to their particular interests. Perhaps a professor could require short papers in response to a few of the essays.” – Amazon Book Reviewer. “Within the anthology will be found pathbreaking works on the theoretical and methodological issues raised by the practice of oral history as well as key writings illuminating the ways in which oral history has expanded our understanding. The authors are to be commended for their commitment to bringing the best of oral history thinking and writing to the attention of a popular audience; work that has been simponal in changing our attitudes toward the practice of history and the development of an international community of fieldworkers.” – Ronald Grele, Oral History Research Office, Columbia University. 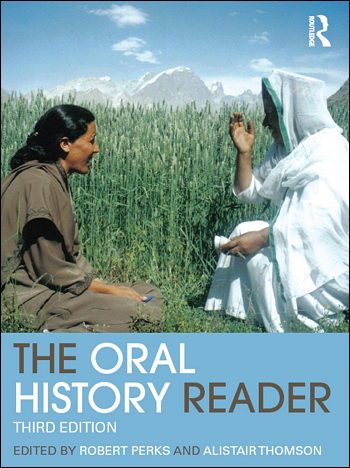 “The Oral History Reader is by far the most comprehensive, valuable collection of articles on the topic in the English language. Perks and Thomson have done a remarkable job of pulling together articles that capture the exciting potential as well as the complex problems inherent in the oral history process. Their historical sweep, from some of the earliest pieces on interviewing to the recent explorations of the use of new technology, offer something to both the novice and the seasoned practitioner. Not content with merely compiling some of the very best published articles on an array of topics, the editors’ commentaries and extensive footnoting point the way to even more avenues of inquiry. This remarkable collection is a boon to students and teachers alike.” – Sherna Berger Gluck Director, Oral History Program California State University Long Beach. “Rob Perks and Al Thomson have made an excellent choice of articles for The Oral History Reader. It is particularly helpful to have them available in one volume. The carefully chosen themes cover the sweep of an oral historian’s work, and will be useful not only to the proposed audience but also to practicing oral historians–both those in the academy and those in the community. This will be a book that stimulates and refreshes us….” – Megan Hutching, Historical Branch, Te Taiwhenua, Wellington, New Zealand.